For much of the year Bangladesh appears more water than land. It can also be a chaotic place. Yet such impressions are misleading, and something I wanted to counteract with a genuine admiration for how people make the best of often difficult circumstances. Colleagues commented on my positive outline when I wrote about innovations in rural extension, in a book published in 2005. 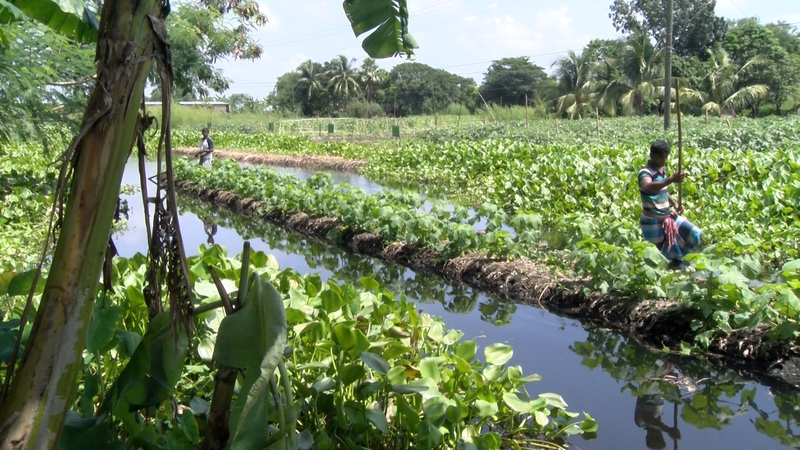 More recently, I’ve been reminded about the resilience and creativity of farmers after watching a video on floating vegetable gardens, now available on the Access Agriculture platform. The video is nicely made, with strong visual shots and compelling interviews with farmers. The dreamy traditional music carries you along in the wake of a wooden boat steered by a Bangladeshi farmer on a shallow, temporarily flooded area. It takes a lot of work to make a floating vegetable garden, but the video reveals an amazing abundance of crops tended by farmers. For years, Bangladeshi farmers have turned two major recurring problems into an opportunity. The land lost to floods during the annual monsoons is used to grow crops; and the world’s worst aquatic weed, the water hyacinth, is turned into compost. Scientists have tried for decades to find ways to control this weed, including the release of weevils that feed on its leaves. 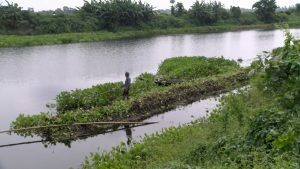 Governments and local authorities have tried in vain to mechanically remove this weed using heavy machinery, creating mountains of water hyacinth on the banks of rivers and lakes that no one is quite sure what to do with. 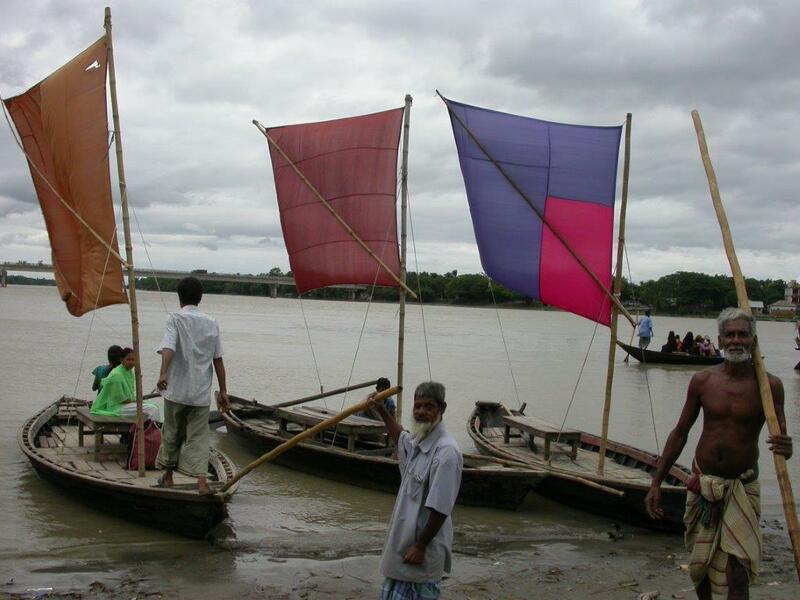 In the video, farmers in Bangladesh show a sustainable alternative. Instead of laboriously removing the bulky mass of water hyacinth, the weeds are left in place. A long bamboo pole is placed on top of a thick matt of water hyacinth and with a hook the water hyacinth is pulled from both sides of the bamboo towards the bamboo pole and compressed to make a compact plant bed. After 10 days the compacted leaves and roots start to decompose and a new layer of water hyacinth is added. Floating beds are about two meters wide and vary in length; some are as long as 20 meters. In the meantime, back home, women have started to grow vegetable seedlings in round compost balls. Once the plants are old enough the gardeners carry them on the boat to their floating garden beds, and insert the compost balls with seedlings in the plant bed. Farmers grow okra, various types of gourds, leafy vegetables, ginger and turmeric. The video also shows how some innovative farmers even connect two floating beds with trellises made of bamboo and jute rope to grow yard-long beans. Farmers across developing countries, and Bangladesh in particular, have a wealth of knowledge. The many training videos hosted on the Access Agriculture platform pay tribute to these farmers and allow them to share their knowledge and experiences across borders. At Agro-Insight we celebrate these respectable farmers in our weekly blog stories. We hope you enjoy reading them as much as we enjoy writing them. The Floating vegetable garden video has been made by the Christian Commission for Development in Bangladesh (CCDB), one of the partners trained by Access Agriculture to produce quality farmer training videos.